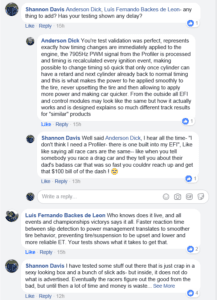 So I have had a few people call me to respond to a “rumor” they heard that a Profiler connected to a FuelTech EFI is not as quick responding as a stand alone Profiler. Tested all of that again today with the latest (and previous) versions of FT firmware 3.1. 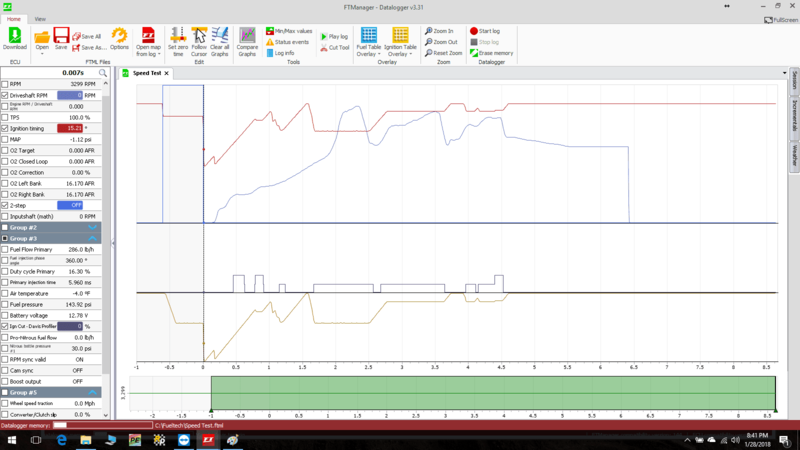 We also confirmed the results on a 4 channel recording O-Scope. 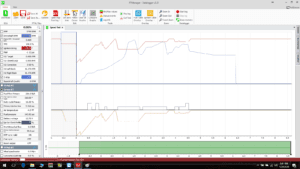 The FT reacts instantly (by the next cylinder) to both timing commands or SmartDrop commands sent by the Profiler (or Profiler EFI Module). So, there is no difference that I can see regardless of the Profiler controlling the ignition directly, or through the FT interface. In this picture you can see the timing ramp down at -.05 to the 2-step timing and then drop instantly (-30deg) to the launch timing when trans brake is released. 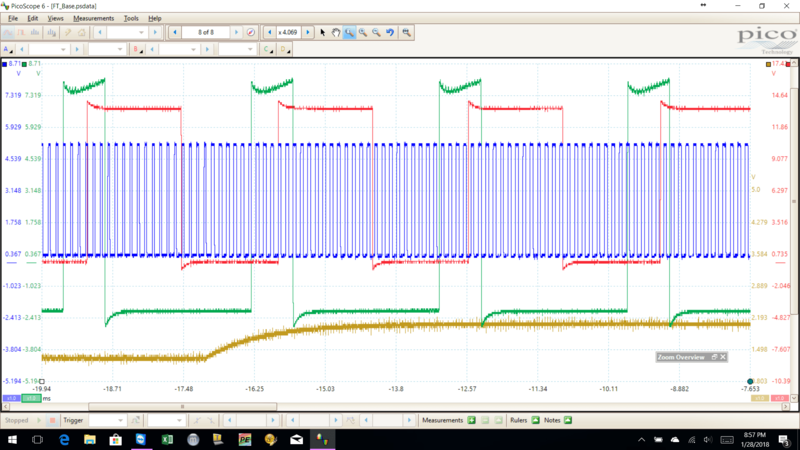 Towards the bottom of the screen is the timing commanded by the Profiler EFI module, and you can see the FT timing is exactly the same and not delayed. You can also see the SmartDrop working between off-Level 1, and Level 2 as the DSRPM goes horribly wrong in this pedal fest example. In this screen shot of the scope- the green is the ignition trigger, the red is the ignition out. The very busy blue square wave is the timing command pulse from Profiler, and the yellow is an analog input to show the timing command at a low enough frequency to see by us slow humans. 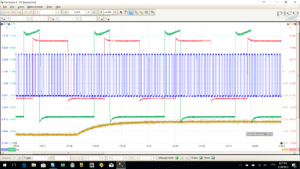 You will see that as soon as the voltage (ylw) starts to rise, the next cylinder starts to retard-the red edge slows as compared to the green edge- from the left. We are commanding the timing 100’s to 1000’s a time between cylinders. This test is at 4600 rpm engine speed. We get the same results from the Holley EFI, as you would expect from any modern EFI system. 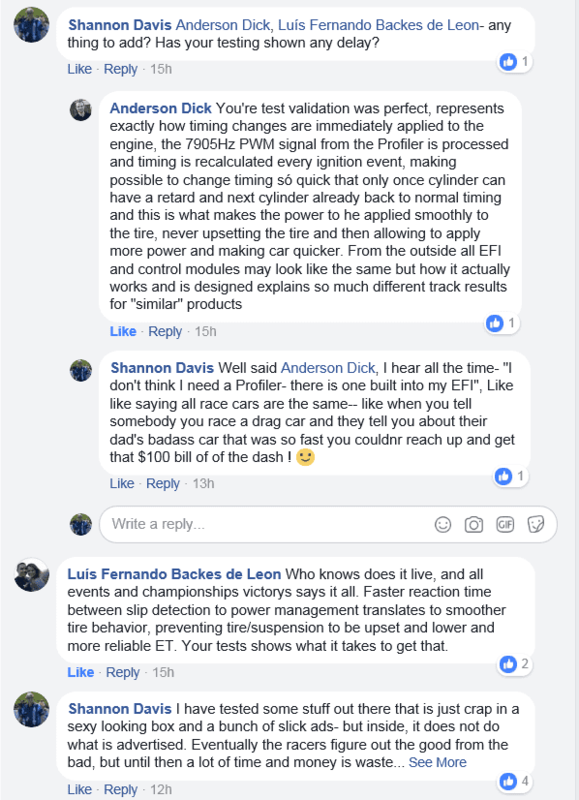 If an EFI system can’t receive input and react by the time the next cylinder fires, you should probably look at another brand :). Don’t believe everything you hear from the haters!